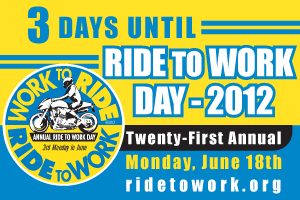 Monday is Ride to Work Day and Rider Insurance wants YOU to participate! We are having a photo contest with a prize of a $100 Visa gift card! To participate all you have to do is take a picture of you and your ride at your workplace and post it on Rider Insurance’s Facebook wall. The photo with the most “Likes” WINS! All photos must be submitted by Monday 6/18 by 11:59pm EST. For confidentiality purposes, names of business and other signs may be blurred or removed if desired. Please ride safe and good luck!